Adrian Anantawan has toured the world as a violin soloist and performed on some of its most prominent stages, but this year marks the beginning of a different kind of adventure: being a house parent to the boys of Forbes House. Adrian takes the baton from Don Dregalla, who retired last year after more than three decades of teaching music at Milton. Adrian is teaching the Middle School strings and winds, Upper School orchestra, Chamber Orchestra and general music in the Upper School. Born in Canada, Adrian has been playing the violin since he was 10, and he performed professionally for the first time at 15. He has performed at the White House, in the opening ceremonies of the Olympics in both Athens and Vancouver, and at the United Nations. Audience members have included Pope John Paul II and the Dalai Lama. He received his undergraduate degree from the Curtis Institute of Music and earned graduate degrees from Yale University and the Harvard School of Education. His first teaching job was at the Conservatory Lab Charter School, a K-8 program in Boston. When Don announced his plans to retire at the end of the 2016–2017 school year, Adrian jumped at the opportunity. Adrian credits mentor Indu Singh, Milton’s dean of teaching and learning, with helping him to acclimate to life at Milton. The School has been accommodating of the performance schedule that he has had in place for more than a year, so he was able to go on a tour through Asia in the fall. 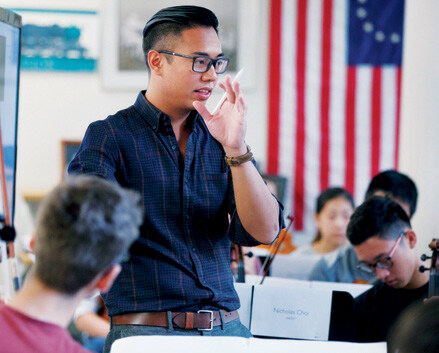 Adrian hopes to eventually increase student performers’ repertoire choices and explore different genres of music in classes, but noted there is a strong foundation in place at Milton. He also plans to continue his advocacy for music education for people with physical, cognitive and emotional disabilities, both at Milton and beyond. “Music should be a point in which those differences are actually strengths, not weaknesses,” he says. Adrian, who was born without a right hand, started playing the violin at his parents’ encouragement. Musicians with physical disabilities, especially when they’re just starting out, learn that finding adaptive instruments can be prohibitively expensive, but Adrian believes that the music world can be more inclusive. Increasing representation of different abilities in music can help.